These products provide a cleaning product in little to no time, ready to use in an hour or so once released into a container of water. 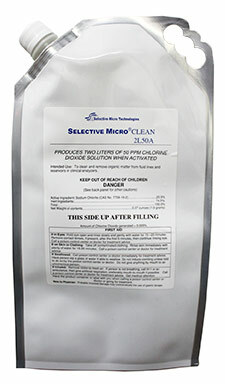 The Micro Clean 2L100A generates 2 liters of 100 ppm ultra-pure ClO₂ and is intended for decontamination of clinical chemistry analyzers and other small clinical or laboratory water systems. The 2L100A is easy to use. Simply remove pouch cap and add 2 liters of water. Let generate for 1 hour. Solution can be diluted, or used as generated. The 2L100A is commonly used for water/fluidic lines, high purity water and clinical equipment cleaning. 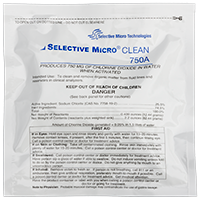 The 750A generates 1.5 liters of 500 ppm ultra-pure ClO₂ and is intended for decontamination of clinical chemistry analyzers and other small clinical or laboratory water systems. The 750A is easy to use. Simply remove the sachet and place it in a covered tank or bucket and generate for 1 hour. Dilute the solution to fit your needs. It can also be generated directly to use concentration using a 10 liter carboy. The 750A is commonly used for water lines, high purity water and clinical equipment cleaning. 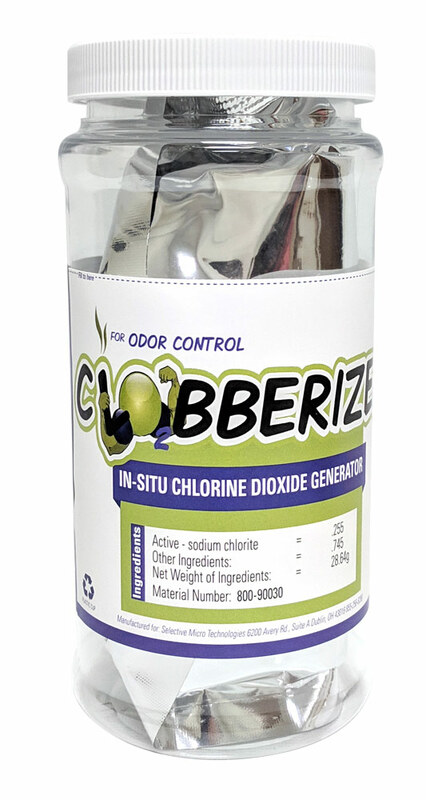 The ClO2BBERIZER is an open space odor eliminator intended for use in spaces up to 1,000 cubic feet per unit. The product is designed to eliminate odors, not simply cover them up with scents or fragrances. Treatment times range from 4-8 hours. 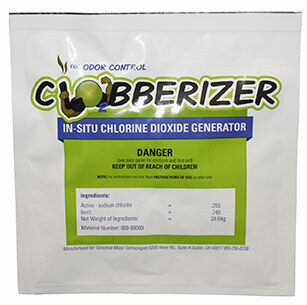 This product provides the same odor elimination technology as the ClO2BBERIZER, but also comes with its own generation container. To use, simply tear open the foil pouch, place the envelope in the provided cup and add water. Cup fits perfectly inside an automotive cup holder! The CleanAir was designed for use and placement within ice machines to provide a cleaner environment. 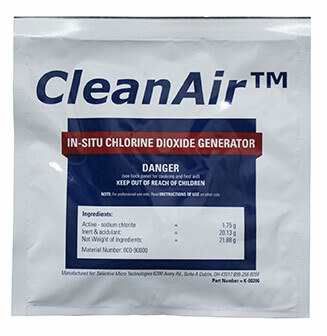 The CleanAir sachet works by pulling ambient moisture from the environment and generating very low amounts of ClO2 gas. CleanAir will provide odor control and environmental cleanliness for up to 30 days. Consistent use may reduce the number of yearly cleanings required. 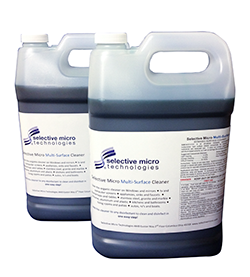 Multi-Surface Cleaner is a bio-based surfactant designed specifically for use with chlorine dioxide. It can be used to remove dirt, oil, and grime from virtually any surface. The product is deliverable in 1 gallon concentrated containers. To use, simply add one half to one full ounce per liter of water for cleaning, or add to chlorine dioxide for an antimicrobial cleaner.